Download video capturing software on Mac and capture videos on/before Mac screen and also online videos in YouTube, Dailymotion, etc. Why need video capture software? The answer will vary from person to person. Some people need a piece of powerful video capturing software because they want to capture the screen activities and record how-to videos, demo videos, or others to share with friends and families; some people seek for video capture solution because they are in need of capturing online streaming videos from a website where there is no available download option; and some may look for a program that can record the activities happening before computer screen. Perhaps none of the above-mentioned is the reason that you need video capturing software. But, the video capture software for Mac recommended here can address most Mac users' needs about video capturing. WinX HD Video Converter for Mac - Available to capture anything before/on Mac screen, capture online streaming videos/movies/MVs on YouTube, Dailymotion, Metacafe and more sites, capture iTunes-DRM protected videos. The versatile video capturing software recommended in this article is named WinX HD Video Converter for Mac. As its name indicates, it is a Mac video converter, but more precisely, it is an all-in-one video converter coming with free screen recorder, video recorder, online video downloader, and photo slideshow maker. And it is widely compatible with Mac OS X 10.6 Snow Leopard and later, including macOS Mojave (10.14). So, what can you do with this video capture software? 1. You can use it as screen capture software to record activities on your Mac screen effortlessly. With built-in screen recorder, you can easily create how-to videos, tutorials about a program or other, game walkthroughs, etc. 3. It is also available to capture and record iTunes DRM-protected videos apart from capturing regular videos. 4. With the assistance of embedded video recorder, you can record everything happening before your Mac screen using built-in camera or external connected camera. 5. This video capturing software records videos in MOV format, but also enables you to convert recorded videos to other formats like MP4, M4V, AVI, WMV, FLV, MKV, 3GP, etc, as well as popular devices like iPhone, iPad, Android tablet/phone, and more. If you want to upload captured videos online, you can use it to convert the videos to YouTube, Facebook, Vimeo and other sites with ease. 6. Edit captured videos by cropping, expanding, trimming and merging; adjust captured videos by setting video audio parameters like sample rate, bit rate and aspect ratio. How to Record Screen Activities and Capture Online Streaming Videos? To begin with, you should free download and install this video capture software on your Mac. And then, launch it if necessary. Step 1. Click "Screen Recorder" button on the main interface, then the Screen Recorder window will pop up automatically. Step 2. Do some settings for video capture. 1. Decide to capture video in full screen or customize the capture area using "Crop Region". 2. Click the gear-shaped icon to set max frame rate, audio device, target folder to save captured videos, and countdown seconds. Moreover, you can also decide whether to capture mouse clicks, open recorded movie when finished, and add recorded movie to convert list. Step 3. Hit "Start Record" blue button, the video capture software will begin recording the screen activities or capturing the streaming video. No time restriction. No noticeable quality loss. Finally, you can get videos captured with voice or audio in good quality. 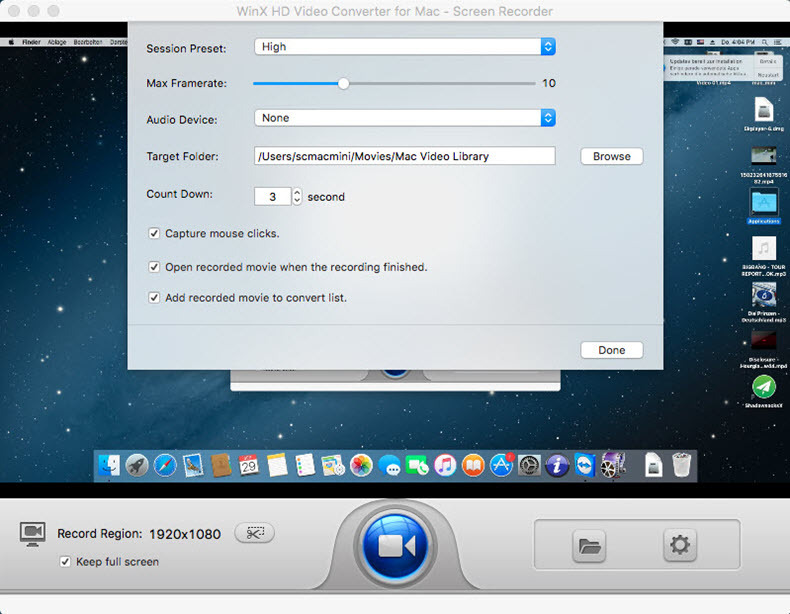 If you want to use this video recording software to create video with Mac's built-in camera or external connected camera, simply turn to "Video Recorder". Only three steps are required as well: hit "Video Recorder" -> do settings for video audio recording -> begin recording. In addition to capture/record videos, WinX HD Video Converter can also free download SD/720P/1080P HD/4K/8K/3D videos, full movies and songs from 300+ online video sites, including YouTube, Facebook, Dailymotion, Metacafe, Vimeo, etc.